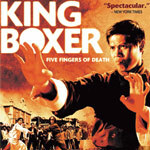 Fans across America know this film as The Five Fingers of Death, although the Dragon Dynasty DVD calls it King Boxer. King Boxer is significant because it’s “the first kung fu movie to be released in the United States.” Several experts make this claim on the DVD, but obviously it wasn’t the first kung fu movie to play in the States because there were Chinatown theaters and grindhouses before 1972. But King Boxer did get released by a major U.S. Studio (Warner Brothers), which was a first. Still, King Boxer is probably the least interesting of the four recent Dragon Dynasty releases. Its significance to American film history aside, King Boxer is pretty average. Director Chang-Hwa Jeong said himself that the story was “common,” and in spite of his attempts to spice it up, it just doesn’t seem to hold up as well as the others. The story in 36th Chamber is better; the production of One-Armed Swordsman is more polished, and My Young Auntie is more visually interesting. King Boxer was made at the Shaw Brothers studio, which was modeled after the old Hollywood studio system. There were contract performers and filmmakers who would churn out new movies under tight deadlines and limited budgets. Korean director Jeong was brought in to make this martial arts movie. The plot, he admits in an interview on the DVD, is pretty common. He takes credit for spicing it up with subplots and groundbreaking visual tricks, but it’s still a pretty bland story. Chih-hao (Lo Lieh), a humble student at a provincial martial arts school, is discovered to be good enough to study in the big city under a renowned master. The best pupil at his local school, Chih-hao discovers that he is barely good enough to earn a spot at the new school. Chih-hao works hard to prove himself, and he’s finally granted the knowledge of a special technique called the Iron Palm, which toughens one’s hands and concentrates chi in them. The glowing orange light on the actor’s hands, along with the synthesizer leitmotif stolen from American TV tells you that someone is about to taste those five fingers of death. The movie has plenty of villains. An ambitious man with a bully for a son runs a rival school. There is a tournament scheduled for the end of the movie that should settle the matter, if it isn’t settled on the streets first. There is a Japanese trio who bring Samurai tactics and karate to this kung fu movie. There’s a mercenary with an unstoppable forehead (he looks like the inspiration for the Klingons). And of course there is the double-cross involving the film’s most memorable grossout: a kung fu leap that ends in the plucking of the foe’s eyeballs. As cool as Quentin Tarantino is, I’m not sure I’d like to have him as a dinner-party guest. He’s a talker. He’s eager and energetic, and that’s great for a short interview, or maybe even a whole audio commentary. But it gets tiring after a while. You start to hope the topic to drift to politics, the weather, the local sports team, anything but grindhouse, grindhouse, grindhouse. Tarantino’s co-commentators hold their own pretty well. Critics David Chute and Elvis Mitchell are nearly as well-versed in kung fu cinema, and they help bring a slightly broader perspective to the proceedings. Between the three of them, it’s a very interesting movie conversation that deserves its own viewing. The DVD also contains three video interviews. At 6 1/2 minutes, the overview with David Chute and Andy Klein is a good warm-up to the feature film. Director Jeong seems to be reading prepared statements; his interview is very dry, but at least he’s prepared. He matter-of-factly lists the things he’d like to take credit for, including the little puffs of dust that fly up when someone takes a fall or lands a kick. Action choreographer Lau Kar-Wing talks about working under the Shaw Brothers studio system compared to working in movies today. He waxes nostalgic, but acknowledges that filmmakers can do more today than ever before. Hidden among the trailers on this DVD is a misleading segment called “alternate opening sequence.” It is not an opening sequence. It is alternate opening titles. There is no new action, just cheap video titles that were probably attached to some American release. Picture quality is as good as on the other three recent Dragon Dynasty DVDs, but there’s less to get excited about. The cinematography, sets, lighting, and costumes, are all more mundane in King Boxer than the other films; they benefit less from the pristine picture quality. Sound is encoded in glorious Dolby Digital monaural. The English audio dub is not half bad, although the hero has too deep and confident a voice for someone with humble roots. The lip sync is good, and more importantly, the emotional match is very good. Still, I prefer the Chinese track with subtitles because it just seems to fit best. Watch the 6 1/2 minute interview with Chute and Klein, and then watch the movie with the Chinese audio. Revisit the movie another night to watch the audio commentary with Tarantino, Mitchell and Chute.